LAGOS OCTOBER 29TH (URHOBOTODAY)-On Sunday, Professor Taiyemiwo Ogunade gave a bombshell interview to the NATION newspaper in which he made startling revelations about those who killed Dele Giwa in 1986. In a subsequent chat with Saharareporters, he spoke specifically about the role of former military administrator of Lagos State Buba Marwa in the assassination of the journalist. 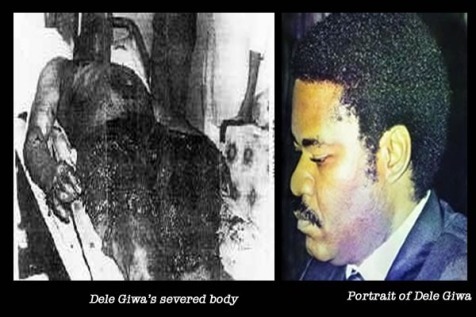 Saharareporters: Do you know who delivered the bomb that killed Dele Giwa? Ogunade: I believe that Buba Marwa did it. Some Mamman Vatsa boys told the full story in New York during a visit to my college to lobby our college to accept to train Nigerian military officers. Ambassador Olusola was on that entourage. [My informant] told me Dele Giwa was killed because he was in possession of a tape containing Vatsa’s testimony before the military tribunal. For four hours, Vatsa requested to tell the full story about how the Babangida regime was operating and his knowledge of the workings of IBB’s mind. He pointed out that after Halilu Akilu and Col. A.K Togun of the military intelligence prepared the parcel it was handed over to Buba Marwa to deliver to Dele Giwa. Marwa is a well–known “IBB boy”. But I was the one who gave Dele Giwa the tape. Saharareporters: How did you get the tape? Ogunade: Vatsa had a copy made by his friends in the tribunal and smuggled out to me and I “loaned” it to Dele Giwa who got on the case immediately. I still don’t know how Dele Giwa found out that I had the tape till this day. Saharareporters: Do you still have a copy? Ogunade: Yes, but you know I left Nigeria hurriedly after the death of Dele Giwa. I left [the tape] with my aged mother, who did not know the value then. I won’t say more, let the military release that tape to the Nigerian public. Saharareporters: Did Dele Giwa return the tape to you? Ogunade: Yes, he returned it after 24 hours. Don’t forget that I loaned it to him; I think he went and played it to Babangida’s people and they eliminated him after they heard the tape. Saharareporters: What about Gloria Okon? It’s been said that Dele Giwa’s discovery of her was the reason he was killed? Ogunade: Gloria Okon is actually Chinyere, that’s her real name. She married Charles “Jeff” Chandler, the fellow who killed Nzeogwu and was killed a day later. Chinyere, Maryam and Princess Atta were young friends who hung out together. They all married into the military, because the military was a proud and respectable profession then. Charles Chandler, who was Tiv, married Chinyere who I think is from Imo State. IBB married Maryam from Asaba and Mamman Vatsa married the princess. So Chinyere became a widow and resorted to trading between UK and Nigeria. And then she was caught with drugs; Mamman Vatsa was the person who put Chinyere on the next available flight from Kano to London – and then claimed that she was dead by parading a dead woman picked out of the mortuary. Dele Giwa later found out that she was in London having delivered a baby by another man. He sent a French photographer to the place and they saw Maryam Babangida at the event. Kayode Soyinka brought back the photographs. Dele was sitting across the table from Kayode examining the photos taken of “Gloria Okon” (Chinyere, Richard Chandler’s wife) at the naming ceremony in London. Maryam Babangida was there. And then a letter parcel was delivered to him and he said excitedly that it must be from “Mr. President” referring to the discussions he had with IBB days earlier. The bomb exploded and severed his lower abdomen; he died a few hours later. Saharareporters: Did you ever meet Marwa again? And did you ask him about his involvement? Ogunade: Yes, Marwa was very active in the Nigerian embassy in New York. For a long time he was the “military attaché” to the Nigerian mission in New York while I was a professor of Black Studies at the City University of New York. He came to my college to sign a $30 million contract with the college so that members of the Nigerian military could attend a “Peace and Conflict Resolution program” and then be awarded a masters degree upon completion of the program. I fought bitterly against it, but the chair of the department, John Muyibi Amoda, badly wanted the money. I kept fighting and one day the college authorities acceded to my request. When I got home the college had dismissed me, but also I got a fax message saying the $30 million had been returned to Marwa. But between Marwa and Abacha they never returned that money to the Nigerian treasury. They shared it. I heard between him and Abacha, over $250 million was laundered through an account used by the New York mission of the Nigerian embassy. Marwa later set up an airline with his share of the loot. When he showed up to run for president I was the one who petitioned the Economic and Financial Crimes Commission (EFCC) to investigate him. He confessed to money laundering in handwritten statements to the EFCC, but today he is the ambassador of Nigeria to South Africa. The police officer that investigated him, Ibrahim Magu, is permanently suspended from the police force after he was humiliated by the EFCC. It is a shameful country. Saharareporters: What else did you do? Ogunade: We helped start the Obama phenomenon in Chicago. Ogunade: We fought and exposed Carol Mosley-Braun who was Abacha’s agent in the US Senate. She was removed from the US Senate because she took $5 million from Abacha to help cover his tracks in the US. We exposed her, which was how it became possible for the brilliant Obama to become the US president today. We set the stage for it.